I am planning on installing a set 45W solar panel on my RV and have a voltage regulator. I will be purchasing the charging control soon. The thing that I am wondering about is the potential for creating a conflict between the trailer's current 120VAC to 12VDC inverter and the charge control from the solar system. I was wondering if anyone knew of a product that could be used in conjunction with a standard charge controller or a specific product that would keep the overcharge protection from both units from defeating each other. I have thought about custom making a low voltage relay unit that will close the 110VAC circuit to the trailer inverter when the solar cells are producing power, but I thought that someone has to have produced some sort of unit to deal with this problem. What kind of solar battery charger do I need for my 12 volt RV battery? Do you recommend these? There are many companies that have solar products designed for RV use. Some popular brands you could look at are Sunsei, Go Power, Sunforce, and Sunwize which all have some good solar battery charger options. We are not familiar enough with all of the brands to recommend just one of them. You should first determine what your solar needs are and then check out these companies websites to see what will best fit your space and power needs. 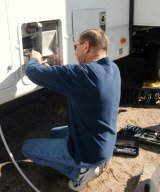 We do have some basic RV solar power information to help beginners understand it more. NOTE to our visitors, if you use solar please add your comments to this thread. I am living full time in my 27 foot travel trailer. Last summer I had a solar panel and a digital solar charge controller. I also had my batteries upgraded from 12 volt to 6 volt (not sure if that is correct). I expected the batteries and panel to keep my refrigerator running at all times and maybe I could even run my TV while dry camping. I guess I should have known better since the only things the batteries run are the lights and the furnace fan and other minor systems. Is there a way to allow the batteries to run the refrigerator and the wall outlets. Thank you. In addition to Sunforce, Go Power! and Sunwize have prepackaged kits for a variety of sizes and needs. Very cool stuff. I bought a "weekender" Go Power! model and it offsets the majority of my electric needs. Full range of options are available for sale online at several sites. I purchased at http://www.PVPower.com. Thanks Tim for your RV Solar suggustions. Everyone appreciates reading great feedback, so we know which products really work for us Rvers.